We here at Playing With Plays are all about opening the world of Shakespeare and Classics to kids through the melodramatic doorway of drama. Our vision is to have every kid in the world love Shakespeare and be constantly exposed to the wonderful stories and characters of these classic plays as well as classic novels. With over 30,000 books sold to date and reaching more than 100,000 kids, we are well on our way! It all started when my son was born… seriously, it did! I decided to quit work and hang out as a stay at home dad for his first year. After about 4 months and about the hundreth movie I watched, my wife came home and said, “you know, you do actually have to make some money.” I was a bit lost, then I found out she signed me up to teach Shakespeare for Kids classes at the local rec center. But, in parallel at that first Hamlet performance, a mom came up to see me afterward and said, “I need you to teach this to my homeschool kids up in Atascadero.” Well, that was a bit far away for me and I replied in such a way to get out of doing this, in which she responded, “I’m not asking you…I’m telling you. We will pay you for gas, but you have to do this!” Well, I’m a sucker for kids, so, I started doing two Shakespeare for kids classes. And then a third came on within a month or so that was WAY too far away, so I did turn that one down. In the meanwhile, I had 3 different drama groups request to buy my scripts from me so they could perform this with their kids. At this point, a real job came along. So, I put the Shakespeare for Kids down for a while, until I came across publish on demand. I started writing and publishing my books and haven’t stopped since. My goal is to do 3 books per year. I have even enlisted other writers to help meet that goal. I left the 9-5 job thing about 3 years ago to do this author/teaching/speaking thing full time! Well, I’m still on my own, and working to meet my mantra, “Get all kids in the world to like Shakepeare!”. BRENDAN P. KELSO came to writing modified Shakespeare scripts when he was taking time off from work to be at home with his son. “It just grew from there”. Within months, he was being asked to offer classes in various locations and acting organizations along the coast of California. Employed as an engineer, Brendan never thought about writing. But, he has always believed, “the best way to learn is to have fun!” Brendan makes his home on the central coast of California and loves to spend time with his wife, son, Edgar the pig, Pat the cat, 2 goats, 3 ducks, 6 chickens (#’s 8-13), 3 dogs, and a fish named Monster. KHARA C. BARNHART first fell in love with Shakespeare in 8th grade after reading Hamlet, and she has been an avid fan ever since. She studied Shakespeare’s works in Stratford-upon-Avon, and graduated with a degree in English from UCLA. Khara is lucky to have a terrific career and a charmed life on the Central Coast of CA, but what she cherishes most is time spent with her husband and children. She is delighted to have this chance to help kids foster their own appreciation of Shakespeare in a way that is educational, entertaining, and most importantly, fun! SUZY NEWMAN is an actor and theatre director based in San Luis Obispo, CA. Her affinity for theatre surfaced later than most and after graduating from college, she jumped ship from her childhood career path and planted her feet firmly on the stage. Shakespeare dominated her first decade of acting and she’s played many of his great women – and a few of his men. She earned her MFA in Acting in 2000 and continues to freelance as an actor, director, acting coach, teacher, and writer. She is also the singer for a rock band, which is simply another opportunity to laugh and create with a group of like-minded people. ANGELA HERRICK is a drama teacher, actor, writer, and director and has a passion for storytelling. A teacher at heart, she believes in retelling these classic stories in a way that makes them fun and accessible for the next generation. Angela lives on the Central Coast of California and loves hanging out with her husband, five children, Savannah the dog, and cats Gatsby and Mayhem. IAN CAMPBELL is a theatre artist and drama educator based in St. John’s, Newfoundland & Labrador, where he is the Artistic Director of the Shakespeare by the Sea Festival. He has produced, directed, and performed in many productions of Shakespeare’s plays. Favourite Shakespearean roles include having played Bottom in A Midsummer Night’s Dream and Sir Andrew in Twelfth Night. Favourite directing projects include The Comedy of Errors and Richard III. Ian enjoys bringing Shakespearean storylines into his workshops with English as a Second Language students, at Memorial University. He holds a Bachelor of Fine Arts degree from York University and a Bachelor of Education degree from the University of Western Ontario. RON LEISHMAN – You can find Ron’s artwork on almost every cover of our Playing With Plays book. He is the main character creator and embodies the fun, melodramatic, and creative nature that each book is about. You can find more of Ron’s work on his website at toonclipart.com. Where he has over 20,000 different toons! SHANA HALLMEYER – A professional troublemaker and creative from birth, Shana has wooed millions with her spunky attitude and infectious spirit. Today she splits her time between towing the party line for the world’s largest retailer and wrangling her family at night. Always unpredictable, on a given Saturday you might find her rummaging the bins at the local Goodwill, binge-watching Stranger Things, or rifling through driftwood along the northern coast of California. ADAM T. WATSON, a nomad of sorts, recently found himself in the central coast. His love of art music creativity and people compels him to push forth in his dreams and endeavors. Presently, his recent venture into the sea of creative competition amongst designers and artists occupies his time whilst he prepares his dreams for future incursions and the snowboarding season. Though an artist by trade and heart there still remains a place for his love of snow, snowboarding and snowboard instruction. He hopes that through his life he is able to encourage people to love, dream and create in a way unrestrained by fear, oppression, and doubt. 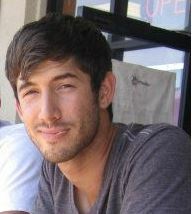 RYAN GOTTLIEB – Born in Connecticut, Ryan moved to the South Bay Area at a young age. He is now studying graphic design at Cal Poly San Luis Obispo. When he’s not in school, you can find him relaxing in his hammock and enjoying the outdoors. He is also a professional downhill skateboarder, who loves seeking the thrill of speed and traveling to find new mountain roads.